It’s been nearly two weeks since Apple introduced the iPhone 5 and by nearly all measures, the launch seems to be a success: 5 million sales over the first weekend and current demand outstripping supply. That’s continued good news for Apple(s aapl), which may be earning more profit on some iPhone 5 models over last year’s phone. But the unsung hero at Apple’s iPhone launch — at least in my eyes — is the new iPod touch, which hasn’t seen much of an upgrade since 2010. How impressed am I with the new iPod touch? So much so that I sold my iPhone 4S; I’ve already ported the number away to the Straight Talk SIM card in my Galaxy Nexus and the sale price is enough to pay the early termination fee and put about $100 towards the 32 GB iPod touch I pre-ordered. And of course, there’s no monthly fee to use the iPod touch, which is a Wi-Fi only device. Just cutting my bills wasn’t the real impetus, however. Objectively covering the mobile scene on a full-time basis means I really need devices for all of the major platforms, including the up-and-coming ones as well. So I have multiple Android(s goog) devices, had an iPhone 4S (and still have a current model iPad), own an older Windows Phone(s msft) handset and even have a Symbian device floating around. I’ll likely consider a BlackBerry 10 handset when they arrive next year if my budget allows and for now, I still have a BlackBerry PlayBook to keep tabs on RIM(s rimm). Even though my needs are atypical, I know there are a number of folks that do want to use more than one mobile platform. And why not? I stand by the idea of using whatever devices best suit your needs, regardless of what’s hip, trendy or popular. For me, Android is best, mainly because I’m deeply embedded in Google’s services for both work and personal use. A stock Android device is optimal in that case. Apple’s iOS has benefits too; particularly for my gaming and content consumption needs, and that’s where the iPod touch comes in. 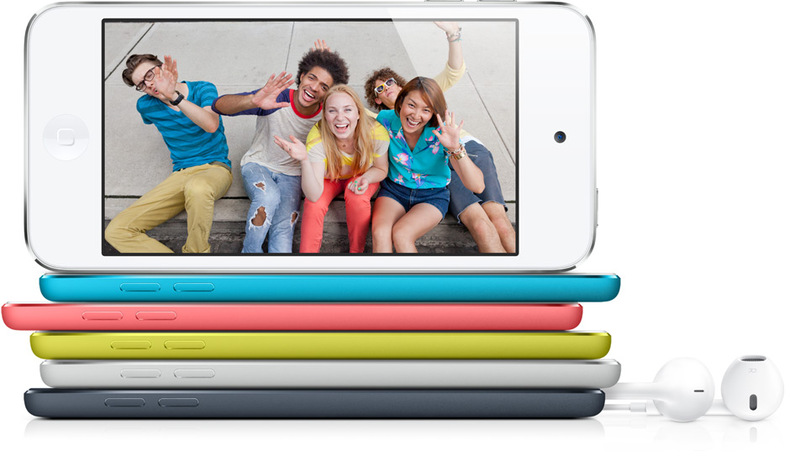 What’s so great about the new iPod touch? Like the last generation iPod touch, the new one mimics its iPhone counterpart in many ways. This year’s model includes the exact same display as the iPhone 5, complete with integrated touch panel and vibrant screen at 1136 x 640 pixels. I was impressed when looking at this screen in an AT&T(s t) store earlier this week; it’s excellent and probably one of the biggest improvements in the device. Besides, I’ve been suggesting that Apple move to a 4-inch display on the iPhone for nearly two years; now that it’s here, I can get it in the touch. Om touted the benefits of the iPod touch’s updated camera and imaging capabilities earlier this month and although I don’t take as many pictures as others, I’m looking forward at trying the new 5 megapixel shooter. I’m also an avid FaceTime user — my wife and son have iOS products — so the new iSight camera on the front of the iPod touch will come in handy, as will the integrated LED flash. Compared to my new iPad, the iPod touch won’t be as fast, but it does use the same chip found in the iPhone 4S, so from a performance standpoint, I’m sure my needs will be met. I’m already used to Siri — particularly for adding reminders — on my iPad and old iPhone 4S, so Siri’s inclusion is welcome. And now that we have 75 Mbps FiOS service in the house, I’m sure the faster Wi-Fi in that new iPod touch will come in handy too. I’ll use the new Bluetooth 4.0 support for both wireless headphones as well as the Wahoo Blu Heart Rate monitor I bought earlier this year. So what’s missing besides that monthly bill I used to have? GPS and mobile broadband are the two big standouts, but I don’t care about the latter. My Android phone works as a Wi-Fi hotspot as needed with no extra charge. Technically, I’m not supposed to use the function with my service plan, but occasional use in the past hasn’t earned me a hand slap from my carrier yet. And the same holds true for GPS; both my phone and my tablet have the radio, so I don’t need it in my iPod touch, which will always be a secondary device. Ironically, those embedded deeply in the iOS camp with some Android curiousity could do the same as me, but in reverse. An iPhone 5 paired with a Samsung Galaxy Player, for example, would accomplish the same. The Galaxy Player is similar to an iPod touch — I’m sure that doesn’t surprise –as it’s a Wi-Fi handheld running Android without a 3G or 4G radio. Again, you may not need or want multiple devices, but for what I do, Apple’s iPod touch is a solid-looking iOS device without the monthly bill of an iPhone. Am I cheating on my Android with an iPod touch? Maybe, but I like to look at is as being married to Android with a little harmless iOS flirting on the side. After reading about the iPod Touch it is definitely on my list … but still trying to decide about the iPhone. I just don’t use a ‘phone’ that much … not really a business person … a ‘dumb phone’ fits my profile. Another reason is that we have no LTE in our area … if I traveled more maybe … but any smart phone is overkill for me. It is a close ‘call’ though for another reason … we have the Verizon family plan and I was thinking of getting iPhones for all four of us … the ‘share plan’ and 10 GB of data is the same cost as the four ‘dumber’ phones we have. But can we keep the data to only 10GB per month among the four of us (half of us are in LTE service zones)? I use the iOS + Mac for work and home = iWork satisfies my needs … don’t need full blown MS stuff and don’t need the apps in the cloud … the iCloud distributes the content and docs among the Apple devices very well. But most of all I like the beauty of the iOS and Mac OS design. Those two OSs are really great. I do appreciate the needs of other people for other OSs but I like do like the higher quality of Apple software … each to their own. People are wondering why you would want an android based player and the main reason I could see is that you can simply plug it in to your computer and drag music right to it. There is no need for media software like iTunes to get music or video on to it. I think he is the most reasonable, pleasant, even-handed, unbiased, non-commercial, thoughtful, blogger in tech today. I have the samsung galaxy player 5.0 & i think its great but this ipod touch 5 mightve beat it with the retina display i think i want it !! The iPod touch went up in price to $300 and the Galaxy Nexus went down to $350 and it can also be used as a phone. Certainly, the iOS ecosystem has a lot of value (like FaceTime and Siri that you mention), but the prices are close enough that I’m not upgrading to the new touch. I own a 2nd gen and 4th gen iPod touch (I think they’re great) and also a Galaxy Nexus (great, but in a different way). Let’s see how much you get when it’s time to sell that Galaxy Nexus. My guess? Not nearly as much. I can understand someone owning the iPad and an Android phone but not sure what value add comes by having both iPad and iPod Touch. Hmmm… I’d bet a good portion of iPad owners also an iPhone or iPod touch; different experiences for different situations. Ack, you’re right hj; I’ll correct that bit now. Thanks! Thanks for the nice article. I also thought about getting me the new touch in addition. But I think it would be just for the looks with much less features. It probably makes sense in your case but where I live and basically all over Europe most of the phone providers give you extra SIMs at no additional monthly costs. I can have up to 5 with o2 Germany (business tarif for EUR 40,-/month) just the activation is around 20.- per card. So I have the iPhone 5 now, still my 4S (selling it soon), a Galaxy SII and an iPad (2) under one contract, one number sharing one data volume (5 GB). And if you don’t have such a contract you can have a data flat rate SIM for EUR 10 a month (in other countries like Austria even cheaper) – why should you miss so many great features an iphone gives you for some new colors of the touch?! ‘will be more versatile and productive’… How? This is so over the top with the propaganda that it’s ridiculous. You seem like a fool for saying it.